Who knew that science could be a superpower? Really, what can't Rick do? Create a truly interactive way to learn about the human body and experience a theme park in at the same time? Check, well actually that didn't go so well. But we're sure it would have been a hit if it hadn't been for the multitude of infections that were coursing the through Anatomy Park's grounds. Now that we think about it, many of Rick's miraculous developments have pretty dark ends. Even his attempts at having a semi-normal house party end in the entire house getting transported to another planet. But it's okay, Rick fixes everything in the end... unless he doesn't. Then he just strikes up life in another reality. Easy, right? If you're ready to take getting stuck in a pickle and roll that vinegar infused cucumber to your advantage, this costume will make you ready to take on your city's rat-ravaged underworld. Who knew getting into a pickle could feel so powerful? 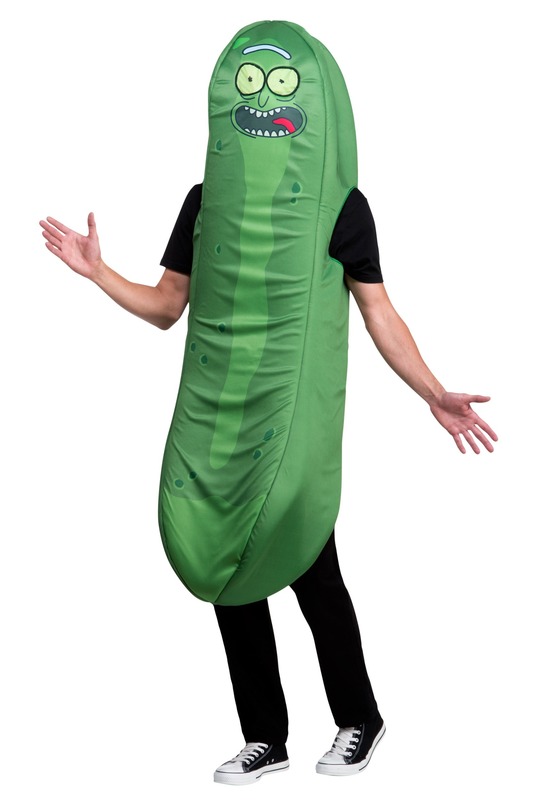 You don't need a mega-genius brain to turn yourself into a pickle this Halloween. What you do need is this easy, lightweight costume. The foam body maintains a tubular shape while mesh for the eyes allow you to see all the non-pickled humans around you for optimum gloating conditions. With holes for your arms and legs, it's never been easier to transform into fully licensed Pickle Rick. While we can't promise transforming yourself into a pickle will get you out of family therapy but we can promise gleefully calling out, "I'm Pickle Rick" will be pretty delightful. And luckily, no one will be able to roll you into a sewer grate when they get annoyed by your enthusiasm. With your handy human appendages, you won't have to fight an entire army of rats to retain your mobillity. It's the best of both worlds and dare we say, it's some kind of genius.